CopyTrans is one of the flagship products by developer WindSolutions and gives iPhone users an excellent suite of programs that can be used to transfer files from your iPhone, iPod or iPad onto your PC. The Suite comes fully loaded with a whole raft of different programs that will make sure you never lose any data off your iPhone ever again! CopyTrans is a really well thought out and simple to set up PC program. By clicking over to their website you can download the installer straight to your computer and be backing up your files in a matter of minutes. In order to install CopyTrans successfully it will prompt you to test your internet connection, once this is done, you are all ready to start transferring from a range of iOS products to your PC. As an added bonus, there is no need to install any app on your device, making this even quicker to set up. One of the best features about is the CopyTrans Contacts function. Anyone who has had the misfortune of losing their phone or even setting up a new iPhone knows that backing up and syncing to a PC is not as easy as it is on a Mac. CopyTrans Contacts makes this a breeze, allowing you to back up contacts, calendars, notes and perhaps most importantly Text Messages. Before you get into the nuts and bolts of this it gives you a nice pop up window with links through to User Guides that make the whole process a lot less confusing as well as a Youtube video that shows you how to get the most out of CopyTrans Contacts. Once you have a good handle on it you can click the iMessage icon in the left hand pane and this will load up all of your phones messages stored on the device. Here you can select and deselect them as you please. Once you are happy with your selections you can head up to the top left hand corner of the program and click Export Selected and with a short wait, viola! All of your important messages are now safely backed up to your PC. 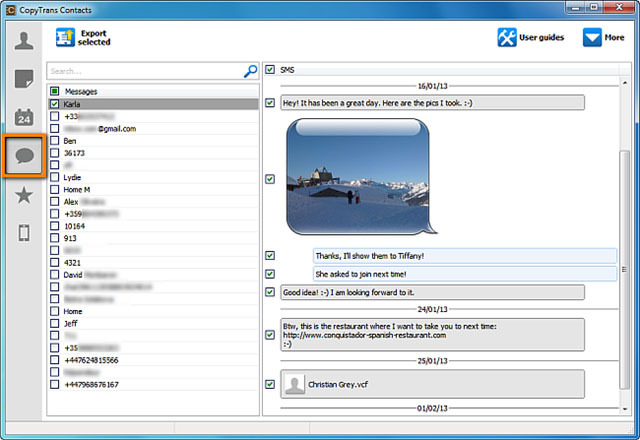 The free version gives you 50 actions, so essentially you can only transfer to your PC, messages from 50 contacts. You have a couple of options if this is not enough for your needs. You can choose to purchase the program from the product website or if you are feeling in a sharing mood you can select your social media platforms and share CopyTrans across them. Doing so will earn you more actions! If you want to go for the more traditional approach and purchase the full version you can do so from the CopyTrans Store. You can tell that a lot of time has been invested in this program. The user interface is clean, uncluttered and with only a handful of clicks we had the program installed and copying messages across to PC. If you are in the hunt for an easy, smart and safe way to get your beloved files from your iOS devices onto your PC you need look no further than CopyTrans.